Comet Tempel 1, target of last year’s July 4 cosmic collision, contains small amounts of surface water ice. Reported in Science by members of NASA’s Deep Impact mission, this finding marks the first evidence of surface ice on any comet. PROVIDENCE, R.I. – Comet Tempel 1, which created a flamboyant Fourth of July fireworks display in space last year, is covered with a small amount of water ice. These results, reported by members of NASA’s Deep Impact team in an advanced online edition of Science, offer the first definitive evidence of surface ice on any comet. “We have known for a long time that water ice exists in comets, but this is the first evidence of water ice on comets,” said Jessica Sunshine, Deep Impact co-investigator and lead author of the Science article. A chief scientist with Science Applications International Corporation who holds three Brown University degrees, Sunshine said the discovery offers important insight into the composition of comets – small, Sun-orbiting space travelers that are believed to be leftovers from the formation of the solar system. The findings help satisfy one of the major goals of the Deep Impact mission: Find out what is on the inside – and outside – of a comet. To that end, NASA’s Jet Propulsion Laboratory teamed with the University of Maryland to slam a space probe into Tempel 1, then analyze materials from the comet’s surface and interior. On July 4, 2005, mission members hit their mark when the copper-tipped probe collided with Tempel 1 and created a spectacular extraterrestrial explosion 83 million miles from Earth. Since then, the Deep Impact team has reported a few key findings. 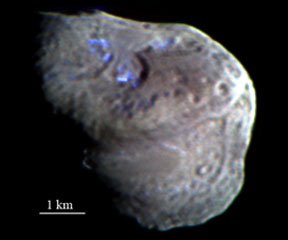 These include an abundance of organic matter in Tempel 1’s interior as well as its likely origins – the region of the solar system now occupied by Uranus and Neptune. According to the new research in Science, the comet’s surface features three pockets of thin ice. The area the ice covers is small. The surface area of Tempel 1 is roughly 45 square miles or 1.2 billion square feet. The ice, however, covers roughly 300,000 square feet. And only 6 percent of that area consists of pure water ice. The rest is dust. “It’s like a seven-acre skating rink of snowy dirt,” said Peter Schultz, professor of geological sciences at Brown, Deep Impact co-investigator and co-author on the Science paper. Sunshine, Schultz and the rest of the team arrived at their findings by analyzing data captured by an infrared spectrometer, an optical instrument that uses light to determine the composition of matter. Based on this spectral data, it appears that the surface ice used to be inside Tempel 1 but became exposed over time. The team reports that jets – occasional blasts of dust and vapor – may send this surface ice, as well as interior ice, to the coma, or tail, of Tempel 1. NASA funded the work. For more information on Deep Impact, visit the JPL Web site.